Game of Thrones is back for its long-awaited eighth season. 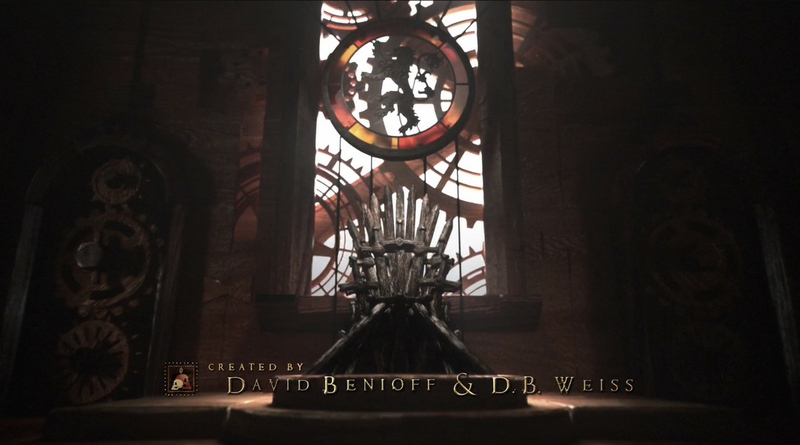 After an energetic recap sequence, the season premiere, “Winterfell,” presented a whole new opening credits sequence, which departs from the title sequences in previous seasons. 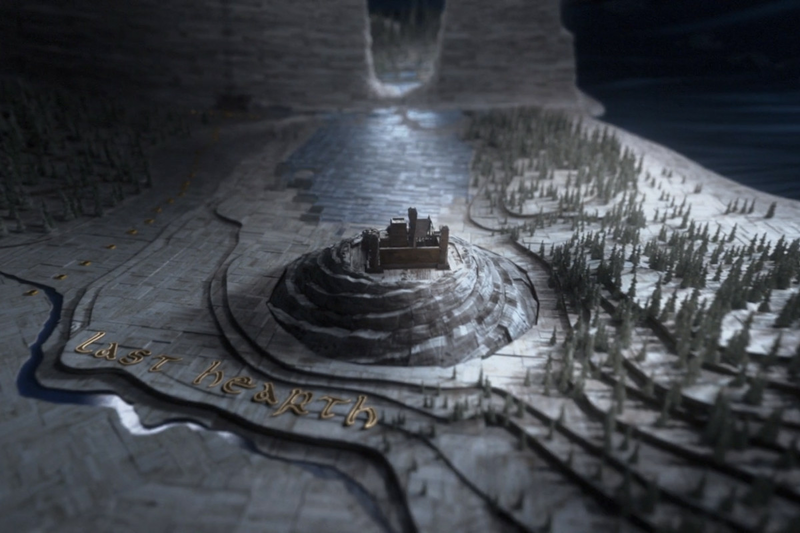 The title segment, which flies a point-of-view camera around a map of the fictional country of Westeros, used to regularly change to reflect locations that might be significant that episode or season. But in the season 8 intro, the action starts outside Westeros, in the furthest north, clueing the audience into the path taken by the undead army of White Walkers that threatens Westeros. First, the camera pans over the broken Wall, which was partially destroyed by the Night King and the zombified dragon Viserion last season. From there, the intro circles the Last Hearth, Westeros’ furthest Northern settlement and the last outpost before the Wall. The Last Hearth was home to House Umber before the Army of the Dead reached it. Off-camera, sometime during the episode, it appears that the army sacked the castle just as its young lord, Ned Umber, was returning to gather his banners. This is a location that hasn’t been of much interest in Game of Thrones to date, but it suddenly becomes relevant to the intro, as Ned’s body was left there, pinned to a wall, along with a foreboding symbol. Usually, the show intro hovers over Winterfell and King’s Landing, plus the locations where Daenerys is visiting that particular season or locations where significant characters are undertaking important tasks. Now, however, as the characters are reuniting and gathering in a few places in hopes of fending off the Night King’s army, the opening credits are taking a new tack. Instead of flying from city to city, the camera is taking us deeper into familiar locations, hinting at the places we’re likely to spend time this season. The camera pans over the meeting hall within the castle, then down to the House Stark crypts. This is where Jon Snow has his fateful conversation with Samwell Tarly about Jon’s true identity and his claim to the Iron Throne. It’s in front of Ned Stark’s statue that they talk about Jon’s true father. That’s also where House Stark keeps its dead, but hopefully, that isn’t what the show is foreshadowing here. Next, the camera turns to King’s Landing, traveling down into the basement where all of the dragon skulls are kept. Then we enter the Great Hall where the Iron Throne is. It’s the first time the Iron Throne has been shown during the opening credits sequence, which feels particularly significant, as, presumably, Westeros’ ultimate ruler will be determined in this final season. Although a Lannister sigil remains atop the Iron Throne, that could change, with two Targaryens vying for rulership. Also notable in this updated intro: the carved imagery on the golden bands rotating around the sun above Westeros has changed significantly. While in the past, the showrunners used these reliefs as a chance to refer to great historic moments, like Robert’s Rebellion and his subsequent victory, the new images capture much more recent history from earlier seasons of the show. One image portrays Viserion destroying the Wall. Another shows the beheading of a direwolf in front of a castle representing the House Frey seat of power The Twins, as a Lannister lion looks on. This is a reference to the Red Wedding in season 3 when Robb Stark, his family, and direwolf are murdered by the Freys, co-conspirators with the Lannisters. The final image shows a larger dragon flying alongside three smaller ones, while a comet falls from the sky. The camera lingers on this image as the Game of Thrones title card appears. That picture is a nod to the Red Comet, which predicts when dragons would return to the world, as prophesied by many soothsayers. (Maybe that fan theory about dragon eggs hidden under Winterfell isn’t as wild as it seemed after all?) Overall, there’s a huge emphasis on dragons in the new intro, which isn’t surprising, given how much of the show has focused on them as the seasons have progressed and how their firepower seems likely to help decide the fate of the world this season. The new bands also suggest that new events to come will eclipse past historical events in their impact, and shape a whole new Westeros as a result.